not sure which expert to address, but oh my, what an excellent site this is; I’ve tried to devour as much as I can. I’ve recently been trying various Latex mattresses in Melbourne, Australia. I’m a slight build 65kg, 5’11” man. I sleep in all the positions. I’ve narrowed my search to the following stand-out companies - all of which have been quite helpful - but am having a little difficulty with the final choice. These are the options. 1. www.mattressbuilders.com.au : Heveya Organic Latex Mattress. A 15cm 75 density core, with a 5cm 75 density comfort layer. The latex is from the Belgium Latexco supplier. I found this mattress quite comfortable. Possibly not enough sinking for my shoulders, but overall pretty good. 2. www.zennalatexmattress.com.au This mattress is a bedinabox variety so I haven’t been able to try it in store. They also use the Latexco Belgium manufacture. They have one slab of 18cm with 75 density. I'm presuming this will be very similar, if not the same as the Mattressbuilder given that it’s the same density and latex supplier (albeit 2 cm’s shorter)? Would the fact that it’s one piece as opposed to two pieces make a difference to the feel? I should note that this mattress is 7 zones as opposed to the Mattressbuilder one, so I’m guessing that may well alter the feel too? 3. www.fernearth.com.au This mattress is also a bedinabox type. This uses Sri-Lankan dunlop latex. Has a firm 5cm layer, then medium 10cm layer, followed by a 5cm soft layer. I don’t know the specific densities. There is also the option for an additional 5cm soft topper. They propose that you can flip the mattress to suit your preference of softer or firmer. If one prefers the firmer side, I’m wondering whether that would ultimately prove unwise given that you’d end up with the softest layer on the bottom? Not having tried this mattress, I’m unable to gauge how it would differ to the others with its progressive layering of densities, so not sure I can compare, but it is never-the-less an appealing choice. 4. www.naturalsleep.com.au : They use the dunlop process from a Malaysian manufacturer. They have many mattresses that I like. Their Chiro Plush is a 30cm thick combination of 15cm of 75 density and 15cm of 65 density of top. This one works the best for my shoulders when on my side, but when on my back it feels like my lower back is bowing a little, with feet and head slightly higher. It did have a comfortable ‘wow-factor’ but I’m not sure how that would hold up when actually sleeping. Strangely, I felt the same bowing feel from their firm version of this mattress too, which consists of 75 density all the way through the 30cm (15cm 75/ 15cm 75). It even appeared like there was a visual bow in this mattress. I can’t tell whether this was due to the base it was on, but we did move it to another base, and the feeling remained. I had the same feeling from their Chiro Supreme 280 (15cm of 75 density and 10cm of 65). I would have assumed that the firm version of the Chiro Plush 30cm mattress (15cm 75/ 15cm 75), which has a firmer density than the Supreme 240, would produce less bowing, yet I felt the bowing sensation none-the-less. Since I didn’t feel the bowing with the Supreme 240 (15cm 75/5cm 65) then it makes me wonder whether this is highlighting that - density aside - I may need to have a comfort layer of less than 10cm? Is it possible to have too much height in the comfort layer, regardless of the density? Or, is there perhaps something suspect about the quality of these mattresses? So I’m left wondering whether the bowing feeling is a bad thing, or whether it is - as the salesperson proposed - the feeling of better “comformity” that I was experiencing? I’d love some advice or any feedback on these mattresses. Thank-you. Thanks for the post. Although we are primarily focused on the North American market, we do try to help any AUS consumers that come to the forum. I am not sure how much of the site you have read so I may end up going over links you have already read. While I can certainly help with "how" to choose ... It's not possible to make specific suggestions or recommendations for either a mattress, manufacturers/retailers, or combinations of materials or components because the first "rule" of mattress shopping is to always remember that you are the only one that can feel what you feel on a mattress and there are too many unknowns, variables, and personal preferences involved that are unique to each person to use a formula or for anyone to be able to predict or make a specific suggestion or recommendation about which mattress or combination of materials and components or which type of mattress would be the best "match" for you in terms of "comfort", firmness, or PPP (Posture and alignment, Pressure relief, and your own Personal preferences) or how a mattress will "feel" to you or compare to another mattress based on specs (either yours or a mattress), sleeping positions, health conditions, or "theory at a distance" that can possibly be more reliable than your own careful testing (hopefully using the testing guidelines in step 4 of the mattress tutorial ) or your own personal sleeping experience. A forum search on Naturatex - at this link. This post #2 here also has many links regarding AUS companies, and additionally, this post has good content for general mattress purchasing guidelines. Just a couple of comments about some of the brands mentioned. Mattress Builders - I don't see any certifications for organic latex, and Latexco, a very high quality leading latex manufacturer does not make a certified organic latex. They should just say 100% natural latex...addtionally I wish they used progressive layering- progressive layering . Don't assume the Zenna is the same as the mattress builers, as there are so many factors...fabric, manufacturing process - finishing, cover style, quilt contruction to name a few that can effect feel. Also putting 6 + 2 together will feel different than one solid piece. The fernearth is similar to the Zenhaven latex in the USA - flippable, and they don't seem to have a problem with the softer layer on the bottom. Plus the Sri Lankans make and sell pretty firm latex, so not sure how "soft" that bottom layer will be anyways. It is hard to diagnose the NaturalSleep issues, as the site and differences between all the mattresses is not well explained. I will leave that to you researching more on this site and asking more questions. I hope this helps a little, we don't really have enought time to do a deep dive into the USA brands, so we can't really committ to researching AUS too much. Good luck, and please ask other questions you may have. In regards to the NaturalSleep mattresses - am I correct that a (5cm layer of 65density on a 15cm layer of 75) should feel softer than (15cm of 75cm on 15cm of 75)? The former feels fairly similar in the shoulder to me but not as bowing in the lower back? Does that imply that the ‘bowing’ feeling I experience is potentially just more “conformity”? Or could I be experiencing a negative effect of a comfort layer that is simply too thick? Or, if none of this makes sense, then perhaps there is something wrong with this specific in-store mattress? Alternatively phrased, is there any utility for an average person to have a comfort layer being thicker than 4 inches? Could there even be a negative effect to too much height? Thanks for posting again, sorry I didn't answer some of those questions, I understand a bit more now. am I correct that a (5cm layer of 65density on a 15cm layer of 75) should feel softer than (15cm of 75cm on 15cm of 75)? Yes, the 65/75 should feel softer, all other variables the same; cover, quilting, foundation, etc. The former feels fairly similar in the shoulder to me but not as bowing in the lower back? Does that imply that the ‘bowing’ feeling I experience is potentially just more “conformity”? Or could I be experiencing a negative effect of a comfort layer that is simply too thick? Or, if none of this makes sense, then perhaps there is something wrong with this specific in-store mattress? I have a couple of questions, but I am listing the specs of the website, as well as a screenshot of the three mattresses you wrote about. The Chiro Plush had a "firm" version, that makes no sense, should have a different name. They clearly state they have 5 graduated densities, but as you say the plush two 15cm pieces, 75/65 for plush and 75/75 for the firm. What was the quilt/cover construction? Were they anything like the photos on the site. The "top" 3" quilt/euro top/fabric can be the bowing issue you feel, and quite frankly can show a body impression fairly quickly on the retail floor. Especially if it is traditional polyester fill. Soft low-cost material on top.... feels soft on the floor... takes a body impression very quickly. The offer a lot of different versions of the cover, I am sure. I can't say there is a "negative effect" of a 15cm comfort layer...it's not common, it's just not as good as it could be. Almost seems kind of lazy product development, but the information on the website implies that someone understands this progressive layering for latex, but the info on the retail floor from the sales people you spoke to is a bit different. At 65kg / 5'11" the latex would barely be bowing. Your BMI is below 20, the latex is not "bowing" that much. Of course, the hips and shoulder are the highest pressure, hips usually higher weight for most humans, so midsection will dip more than shoulders and feet...now whether you or I consider that "bowing" or not, who knows. Making some assumptions, but its most likely the top 3cm bowing first. Plus the mattresses that have been "tried" the most will show more body impressions and will have softened them up over time as consumers keep testing them. Maybe this is affecting things. Thank you once again. This is a most excellent and helpful site. The quilt cover construction was offered in a range. I believe I may have tried both their cover in outlast material as well as in cotton. Making sense of the website description vs the floor staff description, I gather now that their 15cm blocks are constructed of two halves. So more specifically it was 7.5cm of 75, followed by 7.5cm of 75, then 7.5cm of 65, and 7.5cm of 65. I'm guessing their 'fifth' layer is considered to be the quilting? So in a sense there is 5 layers, and there is a progression, but it's not a progressing through each layer. I'm guessing that despite this additional and more specific information, that it still counts as being "not as good as it could be"? And if so, would I be correct in concluding that all the extra "layering" is not necessarily offering more over the Chiro Supreme 240 with it's 7.5cm/75, 7.5cm/75, 5cm/65? Very good points, it could very well be constructed exactly as you have described, it is not bad, and efficient use of 15cm cores to use 7.5 in height. This makes sense and is common in the latex mattress world. I'm guessing that despite this additional and more specific information, that it still counts as being "not as good as it could be"? 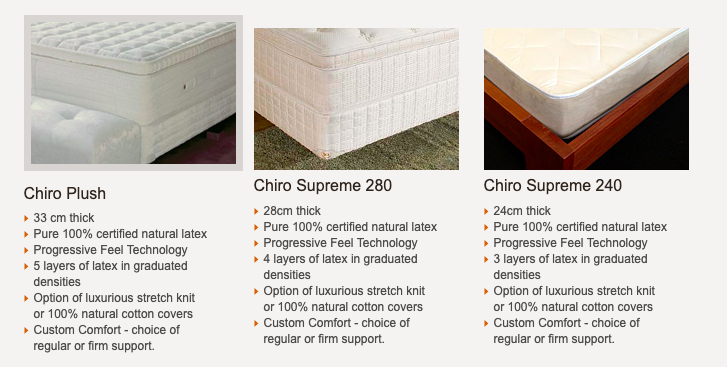 I think you are correct if all of your assumptions are true, that the extra layering of the same densities would be considered "overkill" and you would find very good value at the Chiro Supreme 240 compared to other choices. Of course, I am not saying this is the perfect mattress for you, just that your deduction makes logical sense, and I have seen many latex mattresses adding too many inches just for "retail" value, not consumer need.